For those unfamiliar with photomultipliers, they are vacuum tube device used for detecting and quantifying incredibly tiny amounts of light, even single photons. When incoming photons of sufficient energy strike the end window, they cause electrons to be emitted inside the tube's vacuum by means of the photoelectric effect. These electrons are then amplified by a high potential difference across a cascade of what are called dynodes. An incident photon liberates only a single electron at the photocathode window, but when it is then accelerated into the first dynode by a potential difference, it kicks off a number of electrons through secondary emission, which then accelerate to the next dynode, kicking off even more electrons, and so on. After this process repeats a dozen or so times (for however many dynodes the tube has), that one photon/electron event will have been amplified with enormous gain, up to six orders of magnitude or more, resulting in a signal that can be measured and recorded. They are commonly used as radiation detectors, optically coupled with a material (scintillator) that produces short pulses of light when hit by ionizing radiation. 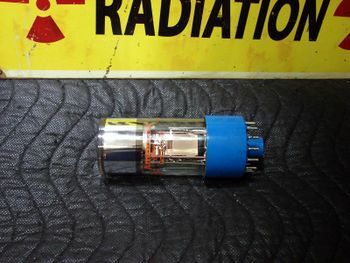 The benefit over their geiger tube cousins is their sensitivity (depending on the size of the scintillator), their versatility (a scintillator can be chosen that is sensitive to different/specific kind of radiation) and their ability (with a suitable scintillator) to not only count pulses, but also measure their energy, allowing for things like spectroscopy. More than one photomultiplier can be coupled to the same scintillator, making it possible to verify with some certainty that a given signal is actually the result of photon emission in the scintillator, which is great for scientific applications. I came across a small lot of old photomultiplier tubes on a Dutch on-line auction site. Besides the usual experiments involving detection of various kinds of ionizing radiation, I’d like to use them to have a look at the properties of some inexpensive and readily available materials that could perhaps be used as a scintillator in place of more specialized, optimized and often expensive scintillators employed in professional instruments. I’ll use this page to document my progress in putting together a suitable high voltage bias supply and voltage divider, as well as a simple peak detector/amplifier, and eventually (hopefully) describe some simple experiments. The tubes I bought are chunky 2’’ units, with a bialkali photocathode composition that has a spectral sensitivity specifically designed to correspond well with the emissions of traditional scintillator materials. They seem to be quite high-end, tailored specifically for research applications, so I imagine they will be quite suitable for what I intend to do with them. I have four to play with. As you can see, these tubes are not exactly new, and have apparently been sitting in a dusty university cupboard for over thirty years. My first impulse was to do some research into whether there was still a chance of getting some useful life out of them after all this time. Luckily it seems that PMTs are generally quite reliable devices. As long as you shield them from excessive light exposure when powered, run them within their specification on a suitable regulated power supply, and avoid undue mechanical/thermal stress on the pins and glass envelope, their service life will end up being equal to their shelf life. As far as I’ve been able to gather, the most important factor determining shelf life is the kind of glass used in constructing the envelope. UV-sensitive tubes require an end window made of fused quartz, because conventional glass attenuates light of shorter wavelengths. Tubes used in applications involving thermal shock are generally fashioned from borosilicate glass. If these design constraints are not of significant concern, tubes are usually made with plain old soda lime glass. So why is this relevant? Surprisingly (to me anyway) it turns out that shelf life is directly related to the ingress of helium gas into the tube. On account of it being tiny and mono-atomic, helium gas will diffuse through the glass envelope, causing the pressure inside to slowly rise until it equals the partial pressure of helium in the air outside. Given normal environmental conditions this partial pressure is quite small (5x10^-6 atmospheres), but it’s nevertheless enough to interfere with proper functioning, leading to undesirable behavior such as after-pulses, or even complete failure of the tube. As it happens, quartz glass is relatively permeable to helium, and so quartz PMTs just don’t have a shelf life that extends much past a decade. After quartz, pyrex/borosilicate are the next most permeable envelope materials, and the least permeable of all is soda lime glass, which happens to be the material used in the construction of the XP2202b. From what I can gather, helium ingress is a very slow process even with borosilicates, and profoundly more so in the case of lime glass, so I have good hope that these tubes are still perfectly usable, with much of their functional life remaining. The actual shelf life you get comes down to the concentration of helium in the storage environment (up to a point anyway, obviously other mechanisms of degradation will eventually start to overtake this particular failure mode) and while I don’t know what kind of cupboard they were kept in, I don’t imagine it was directly next to a hissing dewar of liquid helium. Apparently even a few hours in an atmosphere of pure helium is enough to ruin a quartz tube. I choose to be optimistic and assume that my tubes were stored on a shelf next to the rubiks cubes and spare pocket protectors. See this paper on helium permeability of glass envelopes for more information. An unrelated mention, but if you're reading this you might find it interesting: A common failure mode of helium-neon laser tubes is pretty much exactly the opposite of what is described above. Such laser tubes have a low pressure 10:1 helium-neon fill, but over time the helium will diffuse out of the envelope leading to failure. One way to possibly rejuvenate these tubes is to 'soak' them in an atmosphere of pure helium, thereby encouraging diffusion of the working gas back into the tube, restoring operation. Hamamatsu publishes a fantastic handbook on everything related to photomultipliers and their application. Ebay is a great source for relatively inexpensive surplus scintillators of all types. Old soviet doped sodium iodide crystals, modern plastic scintillators, LYSO scintillators, they’re all available. So far I have not been able to find affordable large volume/ surface area scintillators, such as the ‘paddles’ conventionally used for things like muon detectors. This project is meant to be fun, so I’m just not willing to spend piles of money on slabs of plastic. Besides, I think it would instead be fun to try and make a detector/scintillator constructed with more affordable and readily available materials. It certainly doesn’t have to be highly optimized or competitive to be adequate for my purposes. The first ever scintillator, in use long before the invention of the photomultiplier tube, was silver-activated zinc sulfide. Applied as a thin coating on a screen or membrane, it is used in things like spinthariscopes, fluoroscopes and x-ray photo-cassettes. It’s also responsible for the actual glow emitted by radio-luminescent radium paint (albeit doped with copper, which gives a longer lasting green emission). ZnS screens are inexpensive and available, but due to this compound being quite opaque, they are not useful for constructing high volume detectors. They’re great as alpha probes though, so I will definitely give this a go. Some other early scintillators were made with various aromatic hydrocarbons, traditionally anthracene, stilbene, and naphthalene. Whereas you won’t find the first two at the corner drugstore, naphthalene is quite commonly available in the form of moth balls. Besides the horrendous smell, there are a number of other downsides, unfortunately. Due to the response of these materials being anisotropic (the amount of light produced by scintillation varies with the angle of incidence of the ionizing radiation) it is not possible to use them in applications where you are looking to determine the energy of any particles you’re detecting (unless the incident radiation is in the form of a collimated beam, but since I don’t have a synchrotron, this is not likely to be relevant to my use case). It’s also quite difficult to grow large transparent crystals from these compounds, which is of course necessary if you want to make practical large volume detectors. One way of getting around that problem is to use a suitable solvent, preferably one that has its own scintillation properties, to make a liquid scintillator. Liquid scintillators are widely used in physics experiments, with a vast range of liquid cocktails available commercially. I’m not willing to use expensive specifically purified isomers most suitable for scintillation, or particularly nasty solvents such as benzene, so the possible options are quickly whittled down to only a few contenders. The most likely among them is xylene, which is reasonably inexpensive, not excessively hazardous, and happens to be quite suitable in combination with naphthalene. Surprisingly, another possible contender for a cheap and ubiquitous scintillator is found in regular tonic soda (as in gin-and-tonic soda). Its fluorescent properties are well known to anyone who has ever messed around with a black light, or anyone who’s been to a cheesy night club for that matter. Quinine sulfate, the compound responsible for this effect, apparently does act as a scintillator when exposed to ionizing radiation, although I have no idea of its efficacy, especially at the minuscule mg/L concentrations commonly found in tonic soda. I’m not hopeful, but it’s cheap enough, and in this case failure comes with its own reward, so there’s no reason not to try it. It is possible nowadays to buy fluors that are used in commercially available scintillator cocktails. Prices for compounds such as PPO (2,5-diphenyloxazole) are quite reasonable on Ebay. Even wavelength shifters (used to convert light emitted by scintillation to a wavelength that more closely matches the sensitivity of your detector) such as POPOP (1,4-bis(5-phenyloxazol-2-yl) benzene) are available relatively cheaply and in small quantities. This is definitely something I would like to try. The problem of finding a suitably pure and safe solvent still remains, however. It might be possible to mix the fluor and/or wavelength shifter with some kind of casting resin, allowing you to pour your own plastic scintillators. This sounds easy in principle, but I expect this to be a little more involved in practice. This page is a work in progress. I will list major updates here. 27-7-2017: Acquired a lab-grade linearly regulated supply that is capable of outputting ultrastable bias voltages from 0 to -2500 volts, so the bias supply is now sorted. This page was last modified on 27 July 2017, at 22:42.